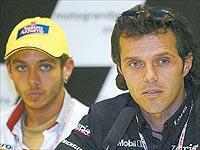 MotoGP World Champion Valentino Rossi predicts Ducati rider Loris Capirossi will be a major threat in 2003. Capirossi has beaten lap records at Jerez and Phillip Island in testing. On the final day of testing in Australia he recorded a time of 1:32.1, 0.1s inside Rossi’s own lap record, and only 0.2s outside the fastest ever lap of the circuit by Jeremy McWilliams. Capirossi’s team-mate, Troy Bayliss was only 0.2s behind, and the performances have caught the eye of Rossi, who said, " " The Ducati is fast, this is clear. I don’t know if they will be ready to fight for the championship, but I am sure that Loris will win some races next season, this is for sure. " Rossi and his rivals will find out just how competitive the Desmosedici is next month when he tests alongside Capirossi and Bayliss at the Sepang circuit in Malaysia on January 20. It will also give Ducati’s engineers a clearer indication of just where they are compared to Honda’s dominant V5. So far they have carried out all their winter tests either on their own or with Aprilia. How do you think the Ducati Desmosedici will fair in 2003? Do you agree with Rossi? Post your thoughts on the MotoGP message board by following the link on the right.